You Can Never Have Too Much Whisky! My wife and I had been attending a whisky and chocolate pairing at our local whisky bar, Helvetica, late one night when I saw a couple whiskies on the drink list that caught my eye. Well to be honest I saw more then a few that caught my eye. More like all of them kinda caught my eye. But since I couldn't afford to purchase them all, much less drink them all, I decided to grab just a couple of extra drams that were rarer then the average tasting. Those were George T. Stagg and the newly released Ardbeg Day whisky. 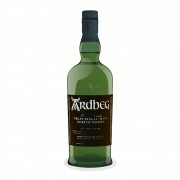 Now when we'd decided to do the whisky and chocolate tasting I was hoping to snag a bottle of the Ardbeg Day release. But I couldn't get the price. I was able to find out that I wouldn't be able to take the bottle home with me though. Especially after I saw the price for a bottle. I mean it's likely to be good, but almost $300 dollars good? But I eagerly purchased a dram, read the bottle while waiting for it and tried to snag some photos of the bottle using my mobile. Did you know that most bars are really dark. And for some reason darkness isn't the best condition for taking pictures with your phone. I hate to break it to you, but if you're holding out for some pictures you're going to be mighty upset with me. But if you're here for a review man I do believe I can help you my friend! So I finally get my dram and head back upstairs to join my wife. She grins at me as I come bounding up the stairs with the tasting glass held carefully in my hands. I plop down next to her and look over at her. "Very" I reply which earns me a light elbow in the gut. So we decide to start nosing the glass. I've been hoping to be able to linger over all the whiskies we tried tonight, but we knew this wouldn't be the case so what I'd done was every 20 minutes or so I would try the next whisky in the line. The goal here was to be able to have the maximum amount of time to spend with the Ardbeg Day whisky and the George T Stagg. So I decided to linger a bit over my newly acquired dram of Ardbeg. Nose it a bit, say hello to it, you know, become friends with my dram. The nose is lovely and very typical Ardbeg, but not. There's the peat, there's the typical burnt bandaids, but quite a bit of sherry sweetness along with vanilla and some spicey cinnamon. Once again a very complex nose from Ardbeg! Whenever I try an Ardbeg all I feel like I can say is...YEE HAA!! I then decide that with the nose being so lovely I have to give it a taste! The flavors are absolutely brilliant! You get the peat and smoke, but the sherry is singing it's lines in the chorus too and isn't overwhelmed by the peat and smoke. Creme brulee and fruits are also throwing up their voices in the song that is this whisky's flavors. This is a very rich and lovely whisky! The finish is awesome with fruit and smoke and sugars lingering on the tongue for quite a while. Can I say again that this is a lovely whisky? Once more I'm left feeling so disappointed that I can't afford to snag a bottle for my own collection. I'd really love to see how this whisky opens up over time. But almost 300 dollars is too much for a bottle of really good, but not perfect whisky. Even more disappointing is that this is a limited release whisky so odds of me being able to snag a bottle and take it home are bloody rare. But maybe not so for you my friends! Maybe you can snag yourself a bottle! If you can. Do so! Just not for $300 bucks. I am so sad I couldn't get my hands on this bottle. Awesome review. I agree with you totally. I would have loved a bottle of this. Just one would have been nice. Oh well could be worse. I could of missed the chance to try it. Hahaha! Thanks for the kind words. I'm sorry to hear that you weren't able to find a bottle. I think most of us were sadly in that boat of either: Can't find or Overpriced. I'm really hoping next year will be better and plan on emailing Ardbeg and seeing if I can't just have a bottle shipped in to me. Will admit the Ardbeg Day was a very good whisky, which left me wanting more, as I only got half a dram though from the now empty bottle at Helvetica, hopefully they can find another bottle before my next visit in a fortnight's time. Helvetica's "bottle" price, is the price to keep a "bottle" behind the bar for you, so it is bar price not retail price of a bottle. The George T Stagg was an interesting whisky to follow it with (I have also enjoyed that at Helvetica). For me I was drinking Islay whiskies and it was the Bruichladdich Octamore 2nd edition, which packed a solid peaty punch, I much preferred the sherry finished, sweeter and more subtle Day. Welcome to Connosr nickobec! I love Helvetica, but yeah the bottle prices there are not retail. Considering that you're purchasing bottles for you to store I don't think it's TOO unfair, but the fact that they've got a similar mark up on the Ardbeg Day whisky when it was only supposed to be around $100 from what I'd heard did leave me feeling disappointed.